It is with a heavy heart I report the death of a creator who is responsible for millions of hours of entertainment worldwide. 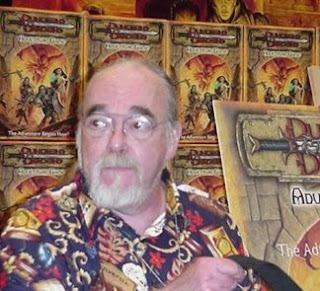 The Co-Creator of the Dungeons and Dragons (D&D) gaming system, Gary Gygax has died aged 69. He had been suffering from numerous health problems throughout the past few years, including an inoperable abdominal aneurysm. In 1971, together with Jeff Perren, Gygax created the rules for Chainmail, his first tabletop game. It was upon this that the extensive rules for D&D were built. Tactical Studies Rules (TSR) was founded by Gygax and Don Kaye a few years later and not long afterwards, the first version of D&D was published. In 1985 he left TSR but he remained prolific as a game designer and writer. He created Dangerous Journeys, an exhaustive, intricate rule-set published by Game Designers' Workshop in 1992. Lejendary Adventure followed in 1999. "While it's hard to deny that most RPGs bear his indelible mark, our industry owes a debt of gratitude above and beyond this to the work of Gygax and his contemporaries toward disseminating the statistical frameworks that underlie most interactive games. Rare is a game development house without a D&D player, current or former, among its ranks. Today, a few of these developers shared their thoughts on Gygax's passing." "I think it's fair to say that D&D continues to be a huge inspiration to everyone here at Blizzard and that Gary will be remembered and missed by all of us." "Trying to capture Gary's vision of D&D was the driving goal for both Baldur's Gate and Neverwinter Nights and we have Mr. Gygax to thank for inspiring us." "He used to hang around the Warhammer 40K tables just moving the pieces around to piss off the players. It was hilarious to watch"
"The Great Man himself has passed away at age 69. Why are the good always taken away from us so young?" "I spent the evening in solemn contemplation. My attempts to cast Resurrection were a failure." "It funny how you don't fully realise the contribution people like him had made until they're gone." As for myself, I think the only way to honour the contribution made by Gygax is to continue enjoy a friendly game of D&D just as he himself did up as far as January this year every Monday night! Rest in peace. 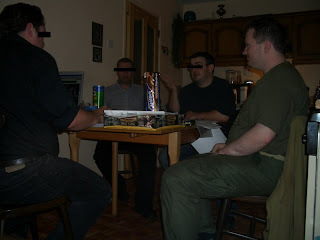 The Colonel (Right) with his elite force of D&D players 2005. Nice writeup. I renewed my subscription to Dungeons and Dragons online yesterday just to play through the Delera's Adventure which Gary Gygax does the Dungeon Master voice for. Instead of rushing the quest as people tend to in DDO we played it just like a pen & paper game. Listening to the voice of the master himself. It was great. I think Mark talked about Gygax's guestspot in D&DOL a few eps of 2IGTV ago. I think I'll go pick up the game in the next few weeks just for this purpose. Wife mentioned to me last night that she'd heard about his death, and asked me if I had. She expressed surprise that I acted as if a beloved close relative had died when I told her I had. Really remarkable to think of how much impact this guy and his creation have had on me and many of my friends. I wish I could have caught him messing with that guy's WH40K miniatures. BTW- Massawyrm over at AICN has a massive three-part hands-on review, overwhelmingly positive, of the new Fourth Edition. So far, I'm really liking what I'm seeing. Check it out, and remember without Gygax, none of this would ever have happened, nor would we have things like World of Warcraft, and, dare I say it, there would probably never have been a Lord of the Rings movie. There, I've said it. BTW- Notice how happy everyone is in the picture of the Colonel's D&D game? That's how most such sessions look. Amazing how much fun the game can be, and ususally is.